small steps starts there. | escaped. I was browsing through Fb when I stumbled upon one of my senior's pictures she took when they visited school. 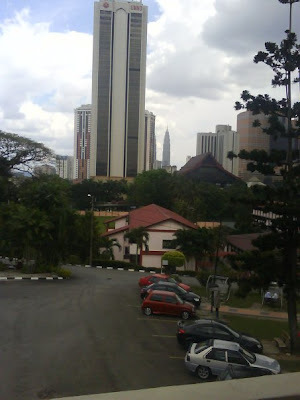 The old one in KL, before we moved to Cyberjaya in Form 4. The one where there were only 400 gurai students, explains why we have no problem acknowledging each other right from the juniors to the seniors. The one which situated right across from UMNO building, PWTC and the precious The Mall where we spent almost every outing there. The one where we spent weeks studying till midnight in the hall and shouted 'Happy Friendship Day' when the clock strikes 12, hugging each other. The one where we had our first big exam, PMR. And the last one. The one where we had to do weeding every weekend from morning till noon while some would complain and some would find a way to have fun chasing each other. The one that somehow allowed us to participate in some events hosted at PWTC; exhibition, show, etc. Some were fun, some were educational, but it didn't matter. The one which even the manager at The Mall's McD recognized us, the students and one of the ones who were sad and missed us when we moved. Where I first learned about homesick-ness, friendship, the importance of straight As. Where I first learned about loving your second family. I can't say I love KL more than Cyberjaya, but KL felt more homey and belonged. erm..tbe2 windu ngan ssp pas bc entry ni..kat KL lg best kan...sbb x rmai kot n lg byk memory yg menyeronok kan..
hahahaha.. i nak ckp i rindu sekolah tu gak but i tak..hahaha..